Gouts of flame are boring all by themselves. What’s the best thing to add to the equation for maximum deadliness? @EldritchReverie – Gouts of oil before the gouts of flame for maximum burninator factor! @samldanach – Toxic smoke being emitted. Visible or not, to taste. @bandofmisfits – The flames burn off all the oxygen in the air. You can’t breathe. @d20monkey – The Gouts of Flame are the gushing wounds of a fire primordial. Yes, they’re inside a dying primordial. @TheeAngryDM – More gouts of flame? Seriously, if your gouts of flame aren’t deadly enough, you aren’t using enough gasoline. A room of scything blades with a sphere of annihilation at it’s center. Dozens of ______’s weilding vorpal ______ await. @thetwixt – Dozens of specters (immune to blades) wielding vorpal whips (forced movement) await. @Chaoticmuse – Dread Wraiths; Vorpal Ghost Touch Scythes. @GenCon4James – Dimension Walkers (so they can “blink” through blades to get at PCs) wielding vorpal pole axes (for reach 2). At the bottom of a 50′ chasm sits a dank pool of offal where an undead Otyugh stirs. What else lies within? @Saveversusdeath – An ethereal shambling mound wight that vomits green slime. @Samldanach – The refuse of a magical laboratory. Roll on Potion Miscibility every round for random effects. @GenCon4James – A Brooding dracolich. The pit is deep and they don’t breathe. Sapphire adorned skull sits atop a pedestal of flesh. Its mouth filled with pearls & cracked teeth. What secrets lie here? @grimtreegames – Cursed, the skull wants to be picked up but when picked your companions are fill with a jealous rage and are compelled to attack and steal the skull. PC’s stumble upon a sobbing tiefling child sitting at the center of a slightly concave chamber thick with ashes. Then…? 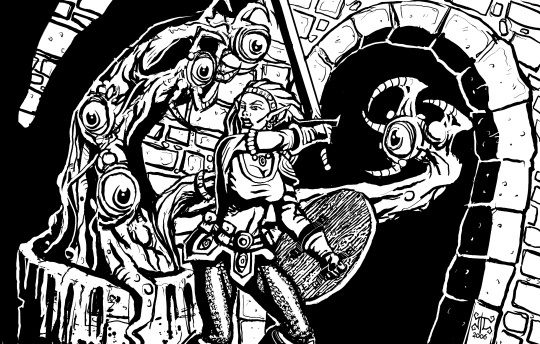 @Gamefiend – The tiefling asks the party a question, and depending on the answer becomes a companion or a demon opponent. @deadorcs – Every couple of rounds the Tiefling cries aloud, sending out a blast wave of disintegrating heat. @GenCon4James – The child is actually a biological lure (like on an angler fish), and the PCs just stepped into the mouth. @d20monkey – If the PCs move to within 3 squares of the child (in a 4 square room), the cries summon Elder fire elementals. A massive crypt’s ceiling is upheld by an iron golem. Bodies writhe on the walls. The pressure plates in the floor do what? @Grinnock – The golem has a conscience. The plates trigger traps to kill the figures, the golem then collapses in despair. @Siliconwolf – Plates cause golem to dance, plates must be tripped in order for correct dance to escape as ceiling crumbles and bodies try to grab PCs as they get close, but their writhing changes giving clues to correct plate order. @GenCon4James– The floor slowly heats causing increasing damage. The pressure plates divert the heat to the golem. How much heat can the golem take before melting and bringing the ceiling down? Each plate diverts a little more.